Really nice 3-1 night last night for us. The reason it was so nice was because our 3 winners were never really in doubt. The Best Bet on the Devils was over before the end of the 1st period, when New Jersey had a 5-0 lead. We also won on the Sharks, who scored twice in the first and led the whole way in a 3-1 win in Arizona, and on the Under 5.5 in Winnipeg, where the Jets and Preds were in a 2-1 game until late in the 3rd. Speaking of that Jets game, we did something with our Under pick that we rarely do – we took Under 5.5 at -150 instead of Under 5 +122. Normally, we would never lay -150 on a total. But we’ve noticed lately that there have been a lot of empty netters turning 3-1 games into 4-1 scores and turning Under 5 wins into pushes. It should have never got to 4-1 last night, but the Preds scored with 2 minutes left and then, sure enough, got an empty-netter. We were glad we’d taken Under 5.5 instead. On to tonight, where there are 5 games to choose from. There originally were 6 games scheduled, but the Ducks/Capitals game got postponed due to weather. 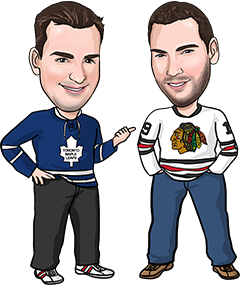 We picked out 2 early games that we really like for tonight’s NHL tips. It’s not wise to rely on trends in your sports handicapping, but there’s a saying ‘Let the trend be your friend.’ We’ll do that tonight, with New York having won 18 of its last 19 games against the Hurricanes. We liked the Rangers enough already tonight because they’ve gotten back to playing their strong defensive hockey. Just once in the past 5 games have they allowed more than 2 goals (excluding an empty-netter by the Islanders with 2 seconds left), and that 1 time was against the Capitals. New York actually outshot the Caps 33-24 in that game, and the Rangers then outshot the Canucks 49-20 Tuesday. The Hurricanes are playing the second night of a back-to-back here, and Eddie Lack will probably have to start for the second straight night now that Cam Ward is on IR. Either we get a tired Lack to shoot at or a call-up from the AHL, so we’re good with both possibilities. The Canes will need strong goaltending, considering that they’ve scored just 3 goals in their last 3 games, and we don’t foresee them lighting up Lundqvist tonight. It all adds up to another Rangers win over Carolina. We lost with Detroit Wednesday night, but we’ll come back with them again tonight. They’re playing better than their recent results indicate, getting 30-plus shots in each of their last 2 games – both 2-1 losses. The offence has been pretty cold, but the Wings always seem to come to life when they face the Sabres. They’re also 6-0-1 in their last 7 visits to Buffalo. Buffalo has had a bit of success lately, winning 4 of its last 5. They lost their last outing to Colorado in the final minute, however, and we can see them having a bit of a hangover from that tonight. This is also Buffalo’s 5th game in 7 nights, always a tough spot.